(01-27-2018, 04:08 PM)Jezze I always wanted to ask, if you ever thought about a modern 16:9 screen format instead of 4:3? Yeah, the 16:9 aspect ratio is something I am all too used to. You guys definitely need to add that in my opinion. Really looking forward to this game coming out. It's hard to believe that this game started development when most people didn't even have 16:9 monitors... I feel old. @Guinea If you're starting a game project today, you probably want to design it with modern displays in mind. However, I can totally understand if you don't want to redo the game to use a 16:9 ratio - as you said, converting to a different aspect ratio often requires adjusting many things throughout the game. (02-04-2018, 10:55 AM)VinnyVideo @Guinea If you're starting a game project today, you probably want to design it with modern displays in mind. However, I can totally understand if you don't want to redo the game to use a 16:9 ratio - as you said, converting to a different aspect ratio often requires adjusting many things throughout the game. It is a lot easier to fix up a 3D game for different aspect ratios. 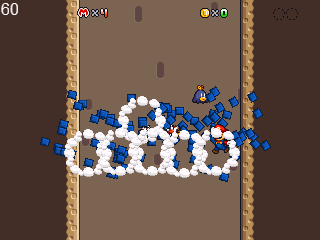 In 2D games like this one, the basic unit of building levels is a screen. 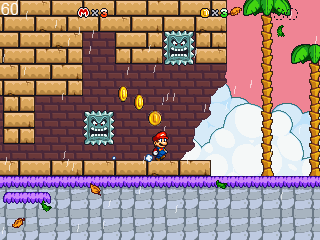 It would be kind of like designing the whole game around Mario being able to jump 4 blocks high and then making Mario's jump 3 blocks high in the last minute. You'd have to change all the levels to accommodate for that change, or you didn't design your levels very well to begin with. In Midas Machine, especially the bosses and cutscenes and bonus rooms would suffer from such a last minute change, not to mention the UI. All the available real estate was filled with the necessary stuff to make it work, and adding 50% extra space would make a lot of scenes feel quite empty unless they get a thorough do-over. Perhaps you could fill the extra space with HUD informations à la NSMB? I don't know if that's simple to make though. What would go into that HUD? The current HUD they have is minimally-sized as it is - They'd have to bloat it in order to fill up the added negative space, come up with a new design for it, probably have to come up with new information to put in it to fill up more space, and render new views for every single room in the game. Or they could just leave everything at 4:3, like every single Mario game released before 2001. I think it's fine as it is. (02-04-2018, 03:12 PM)Zero Kirby What would go into that HUD? The current HUD they have is minimally-sized as it is - They'd have to bloat it in order to fill up the added negative space, come up with a new design for it, probably have to come up with new information to put in it to fill up more space, and render new views for every single room in the game. I think it's fine the way it is, so I would have to agree with Zero here. Sure, it would look a lot nicer, but the amount of time it would take to make everything set to modern standards would be an overwhelming long while. Black bars on the sides wouldn't bother me as long as the pixels were more smoother with the 16:9 aspect ratio. Okay, so there was a level in the game that, looking back on it, is kinda lame. Guinea hasn't made the specific object I need for it yet, and honestly, said object would only be for that level, so I decided to drop that level in favor for a new one that I'm honestly enjoying. This lost island is constantly stuck in stormy weather, with a constant strong wind that makes it hard to move back. You can find plenty of torn up ruins, plus enemies you don't see much anywhere else. You can hide from the winds in those caves, but it won't help. Grabbing onto vines will though. Now to go back and start decorating the level! 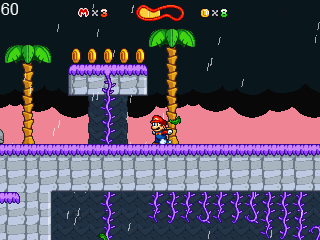 Windy/rainy levels are fun. I'd like to see more fangames make creative use of weather. I'm so excited for this game. Did you dudes use a game design document? I mean, 16:9 is not required for the game to be good... at all, but it'll be a tad weird going back. And please tell me you changed the New Game, Load, and Credits text on the title screen has been updated. 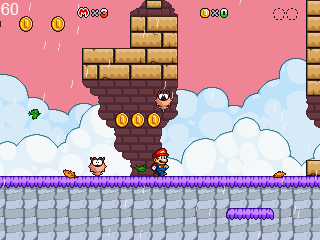 This game is looking to be one of, if not the best Mario fan game out there! Keep up the great work! I promise it will pay off. ok i've got the right thread this time (tfw your first post is on a wrong thread). i kinda fell off the hype train when i had to switch to mac, but i tried it on wine and (surprisingly) it worked fine(? haven't gotten past level 1 which i'll elaborate on later). most games i've run on wine run awful (heck yeah psycho waluigi at a whole 5 frames per second) looked a bit blurry in higher screen scales but maybe that's only more noticeable now my screen is bigger than my face (ok my laptop was a lil bigger than that). anyways, i can't really get a good feel on the controls, any recommended control schemes? P.P.S: found a mistake on the website, light takko apparently emits "engery"
I don't think we have much to worry about. The big issue with AM2R is that it was a direct remake of an official game, and thus could actually mess with potential eshop sales with Nintendo, plus they were remaking it themselves, so yeah, a fan remake was a big issue to them. Theres also the fact that we aren't really advertising it or anything. On another note, just to give an update, I'm working on the post game levels, and I'm about halfway through them all. That said, the last two are rather hefty, but they should be worth it, although I may drop one of them as I'm unsure where I want to go with it overall. Playground rumors are fun. c: This kinda reminds me of another game I played where there was a Mario reference - You could fake out the stage by following the logic. but the true stage would be revealed if you fell into the only hole on level structure. What is this talk I am hearing about post game levels? Post-Game Levels are levels that are played after the main campaign, also known as Extra Levels. On Psycho Waluigi, for example, there are levels that play after the ending, mostly challenges. Post-game levels usually play on another story lead, or are just for fun and skill-testing, and usually show some new, oddball mechanics. Another example of game that had post-game levels is... "Toad Strikes Back", and "Toadette Strikes". On Toad Strikes Back, all medallions on a zone unlock the extra stage. 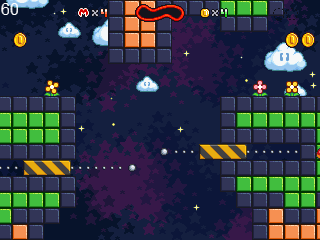 On Toadette Strikes, there's the Fungitorium, where you can exchange medals for levels. Based on how many you have. To clarify (I may have said this before, but I don't recall), for the post game, I wanted to make use of some various ideas I had that didn't really work in the main game worlds, or weren't major enough to make a full level of. The post game levels are all on the short side, being roughly the length of the first level of the game, but are also on the tougher end of things. That said, they also lack midpoints. This means that if you die, you have to start over, however you also won't lose lives. Sorry for the silence, I've been finishing up the post game levels, plus general main game level cleanup. Heres a tiny snippet of a thing. An odd land of pixelated trees. Not the fanciest shot, but this falling section is pretty fun, although I need to fix some issues in it that can result in the player becoming trapped.